A Block-type property is a composite object property that includes several properties combined in a table. In Web Application, a Block property is displayed as a table, whose columns are the block properties. Each block entry is a block object instance, i.e. each block entry is an independent object, which has a parent to which the entry belongs. When working with block items, DO NOT call the item.Save() method, since it may corrupt the database integrity. If you need to add a new block item, use the method context.Block.Add(item). In this case, the item will be marked as added and when saving the context (clicking Actions - Save in a business process task or going to the next step) the data will be saved automatically. If you need to delete a block item, use the method context.Block.Remove(item). If you need to delete a block item, read this article. Task: perform actions with two numbers (sum up, multiply, divide) and write the result to a block. 2) Action with numbers (String type). 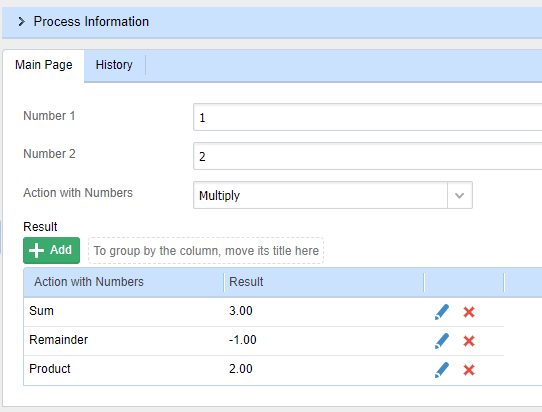 The properties Number 1 (Fraction), Number 2 (Fraction) and Action (Drop-Down List, with values Sum Up, Subtract, Multiply) were added to the form. Also, a button with a script was added. As the result of the script execution, the block will be filled in. The script for changing a form property value is similar to the script on a button, described above. Task: Set property values for all the block items when executing a script in a Script activity. 2) In Stock (Yes/No type). In the first business process task, a user fills out the block manually. A Script activity is placed after this task. The script sets the False value in the In Stock property for all the block items.